On February 6, 7, and 8, I’m teaching a class on rolls at the annual Atlanta Workshop. Information for the workshop is on www.atlantapipingfoundation.com. It’s not too late to sign up! Introduced my system of classifying rolls. Attachments 10.2, 8C and 83 are the hand outs for the class. After the workshop, I will wrap up the blogs on rolls with blog 31. 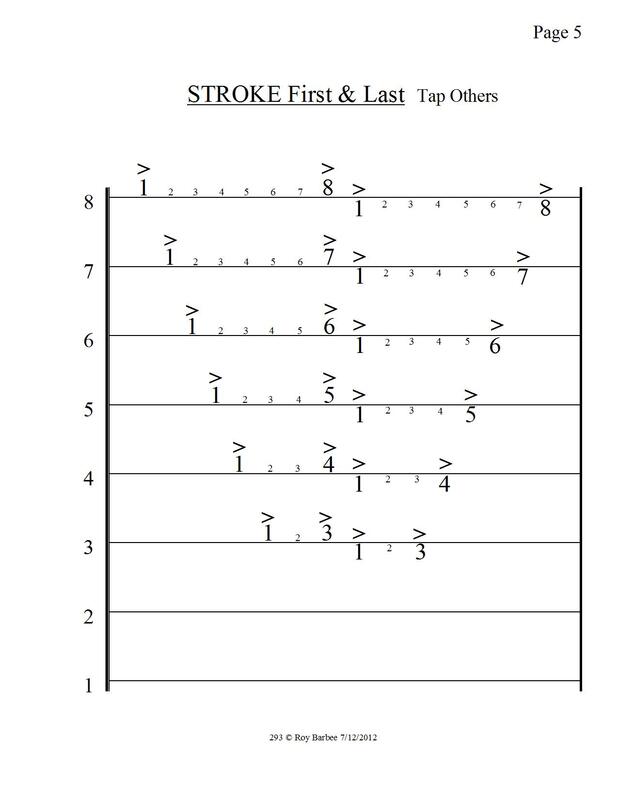 The Continuous 13 Stroke roll has 7 primary strokes which I think of as 7 wrist movements. Tap the 1st wrist movement. An accent (>) over a roll always indicates a single tap. Practice your wrist movements without sticks. Just air drum the primary strokes while thinking the single taps. By now some of you have realized that it difficult to mathematically write rolls with triplets because our system of notating rhythm is binary based. Also, when a root roll is altered, a new root roll appears as in the Continuous 13. The root roll revealed is an 11 stroke root roll. So, really there are only root rolls. Blog 29 will explore my classification of rolls in more detail. You will need a teacher to help you learn to play smooth rolls. The following chart and practice patterns are to help you prepare for a teacher or workshop. The following attachments are PDF files. 56.1 is a 4/4 chart of The Continuous 13 Stroke Roll. 56.2 is a 6/8 chart of the Continuous 13 Stroke Roll. “Practice slowly for fast results”. The Snip-Snap 13 Stroke roll has 7 primary strokes which I think of as 7 wrist movements. Tap the 1st 2nd and 6th 7th wrist movements. An accent (>) over a roll always indicates a single tap. Practice your wrist movements without sticks. Just air drum the primary strokes while thinking the single taps. 55.1 is a chart of the Snip 13 stroke roll. 55.2 is an on the beat Snip13 stroke roll 4/4 practice pattern. 55.3 is an on the beat Snip 13 stroke roll 3/4 practice pattern. The Tap-Snap 13 Stroke Roll is one of the common rolls in Scottish side drumming.The 13 Stroke roll has 7 primary strokes which I think of as 7 wrist movements. Tap the 1st wrist movement and the 6th and 7th wrist movements. An accent (>) over a roll always indicates a single tap. Practice your wrist movements without sticks. Just air drum the primary strokes while thinking the single taps. 53.1 is a chart of the Tap-Snap 13 stroke roll. 53.2 is an on the beat Tap-Snap13 stroke roll 4/4 practice pattern. 53.3 is an on the beat Tap-Snap 13 stroke roll 3/4 practice pattern. The Snip 13 Stroke roll has 7 primary strokes which I think of as 7 wrist movements. Tap the 1st 2nd and 7th wrist movements. An accent (>) over a roll always indicates a single tap. Practice your wrist movements without sticks. Just air drum the primary strokes while thinking the single taps. 54.1 is a chart of the Snip 13 stroke roll. 54.2 is an on the beat Snip13 stroke roll 4/4 practice pattern. 54.3 is an on the beat Snip 13 stroke roll 3/4 practice pattern. The 13 Stroke Roll is one of the most played rolls in Scottish side drumming. I call the pure rolls Root Rolls which I borrowed from computer jargon. In future blogs I will be dissecting altered Root Rolls which will cause them to need a new name for instant identification. The 13 Stroke roll has 7 primary strokes which I think of as 7 wrist movements. Bounce the first 6 wrist movements of the Root 13 and end with a tap on the 7th wrist movement. Practice your wrist movements without sticks. Just air drum the primary strokes. 50.537 is an on the beat 13 stroke roll 4/4 practice pattern. 50.537A is an off the beat 13 stroke roll 3/4 practice pattern. 50.32C is an on the beat 13 stroke roll 6/8 practice pattern. Compare this blog post with my previous post which features the 70 Divisions of the Quarter Note. The rhythms are the same. They are just using different beat notes. People determine tempo. Notes don’t. At 80 beats per minutes, 4/4 and 4/8 practice patterns sound the same. The attached exercises and charts will hopefully help you develop your drumming vocabulary and sight-reading. 5G is 70 Divisions of The Eighth Note arranged as 4/8 practice patterns without syllables. 1960H is 70 Divisions of The Eighth Note arranged as 4/8 practice patterns without syllables with the stems up and 64th notes for the end of each pattern. On a beautiful spring day in 1500, the Monks of The Order of the Notes were busy putting things in order. But, trouble was coming in the gate. The Odd Meter Monk had arrived. It didn’t take long for an argument between The Common Meter Monk and The Odd Meter Monk to disrupt a peaceful day. They were shouting over each other and the next thing you know, they were beating their staffs on the floor at the same time. The Common Meter Monk was beating in 3/4 and The Odd Meter Monk was beating in 6/8. Their brother monks had enough of this bickering and fighting. They made both contentious monks sit down and be quiet. Hmmmm… could be the origin of the first “time out”. One way to figure 2 against 3 is by making a number chart as below to play with your hands. Play only the bold numbers in ( ). Notice, 1 hits at the same time. After you make the number chart, you can figure out how to notate it. As a modern monk, your assignment is to explore Hemiola, Poly Rhythms, and Cross Rhythms from articles and musical examples found on the Internet. This attachment is an example of 2 against 3 and 3 against 4 as written in music. When Does the Compound Note become the Beat Note? “Because we’ve always done it this way!” shouted the Type Setting Monk to the Composer Monk and Time Signature Monk. “But this is the 1600’s”, said the Time Signature monk. As the monks were leaving, the Compromise Monk and the Conductor Monk came in the door. “Why are you aggravating the printers”, said the Compromise Monk? “The printers won’t make compound time signatures because they claim the established time signatures are all we need”, said the arguing Monks. “Let’s go outside and talk”, said the Compromise Monk. The Baroque Period produced some interesting rhythm patterns with groups of two and three mixed mostly to match the dances of the day. Search Baroque Rhythm for more information. The dotted note became known as a compound note because it was made by combining three like notes to form a number system that has 3 as its base. Let’s review the first blog featuring the Quantize Chart. Notice the top half of the chart divides the notes into binary or duple parts. The Bottom half of the chart divides notes into ternary or three parts. The odd divisions of 5 and 7 at the bottom of the chart are not used as beat notes. A beat can be divided into any number of parts which 99% of the time are divisions of 2, 3, or a combination of 2 and 3. Hopefully, the attached chart will help you understand Binary (base 2) and Ternary (base 3) beat notes. Remember this… binary/duple beat notes have a Down Beat and an Up Beat. Dotted Beat Notes, or Compound Ternary/Triple beat notes have a Down Beat and TWO Up Beats. Sostenga el punto! Tenir le point! Halten Sie den Punkt! Tenere il Dot! Segure o Dot! Trzymaj Dot! Hold the Dot! “Hold the Dot” was exclaimed right after the first piece of music was published that used the dot. Music teachers couldn’t get students to hold the dot long enough and it drove conductors crazy. Jean-Baptiste Lully was probably shouting “Hold the Dot” when he clubbed his foot while beating time with his staff. The Dot is a killer. The Baroque era was an exciting time with the development of complex rhythms and note ornaments which caused innovation in writing and performing music. Rhythm was no longer defined by the binary Order of The Notes. The Pie Chart Monks of the early Renaissance wouldn’t have believed the pollution of music by elaborate ornamentation. Music had to be interpreted. And, the Dotted Note they had created had also become a matter of interpretation. They would have shouted “Heresy!” The Baroque Composer Monks were forced to introduce the Double Dotted Note as a visual aid to help with the idea of holding the dot even longer. How many dots can be added after a note? I have only seen Double Dotted Notes. Remember, the dot is an abbreviated note. See the attached PDF charts. On New Year’s Day, 1700, the Composer Monks, the Calligraphy Monks and the Type Setting Monks were determined to figure out how to write a note lasting three beats in 4/4 time without tying three quarter notes together. They needed a better way of writing a long‐short and short‐long duration of sound. Bagpipers refer to long‐short as “dot and cut” and short‐long as “cut and dot”. Becoming frustrated, they took a break and reminisced about simple notation before The Pie Chart and printing press, when duration of sound was not mathematically fixed in a binary grid. Oh, for the days when length of pitch was indicated by gestures, a few notes and a grunt. Without notice, the Odd Meter Monk dropped by. Irritatingly cheerful he said, “Happy New Year”. The conservative, traditional Monks, hadn’t invited the Odd Meter Monk because… well…. he was odd. He was attracted to 3/2, 3/4, and 3/8 time signatures. He had already figured out the problem of tying three like notes together. “A dotted note!” they all exclaimed in unison. They had to acknowledge the simple brilliance of the Odd Meter Monk’s solution. A common explanation of the dot is, “A dot after a note lengthens the note by half its value”. A few people get it from the quoted statement. Most of us have a vague understanding, and some of us don’t get it at all. Bless those that teach the Dot. The concept of the dotted note made possible the Compound Beat and Compound Time, which will be discussed in the next blog. The Morse Code attachment and the Dotted Note Chart will help you understand the dot as an abbreviated note. The Monks were out of character: “No! ” said the Calligraphy Monk. I like flags because of the aesthetic beauty. When the argument was over, the Calligraphy Monk gave in to the Engraver Monk and printing press technology. Function and practicality had won. Music was no longer a piece of art, it was a practical chart. Jazz musicians refer to written music as charts. The Architect Monk came up with a solution for the flagged notes which he called Beams. Everyone agreed that Beams were cool. One Beam = one 8th note Flag. Two Beams = two 16th note Flags. Four Beams = four 64th note Flags. Beamed notes were easier to write, didn’t take up as much space on a bar of type, and could be grouped together which made it easier for musicians to see divided beats. The Renaissance Period was becoming The Classical Period and more complicated exciting music was being written. The Time Signature, the printing press, the Down Beat-Up Beat, and rhythm included all the binary divisions of the Pie Chart (illustrated on a staff). This chart illustrates the binary divisions of the whole note (Pie Chart) using Flags. Set your printer for landscape. The numbers down the left side indicate the division of the notes. For example, 4C divides notes into four parts. The second chart is the same Flag Chart written using Beams. Compare the two charts. Look down the chart columns to see the divisions of one note. Look across the numbered lines to see how the same division looks written in The Order of the Notes. Attachment 92B.MUS will play the Beamed Quarter Note Column exercise written in Common Time (4/4) on your computer. To do so, download Finale Reader, a free program. will not play with Finale Reader. Set your printer for Portrait. Note. Count the note heads. 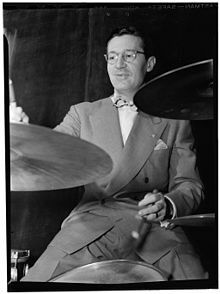 “Beat Me Daddy, Eight to the Bar” is a boogie-woogie song written in 1940 by Don Raye, who credited Ray McKinley, a really cool drummer, with the idea. Ray used Hipster Slang to tell pianist Freddie Slack, nicknamed “Daddy”, to start a boogie beat by saying, “Beat me Daddy, Eight to the bar.” (Thanks Wikipedia) I had the good fortune to play Ragtime and Boogie-woogie with Jo Ann Castle when she played a show in Lubbock, Texas around 1969. It was pure fun and she did beat me eight to the bar. Get back on the subject! OK. I don’t know anything about printing, but I can imagine it involved creating music to fit movable bars of type, hence the bar line. Why else would we have a bar line? So, the first Time, or Meter symbol must have been the letter C, for Common Time, or 4/4 as we write it today. It was probably called common time because the divisions of one Whole Note fit one bar of movable type. I don’t have proof, just speculation. Let’s revisit our Monks and their various activities… The Strathspey Dance Monks liked Common Time because it had a strong down beat at the beginning of each measure. “Perfect, “they agreed. “Oh no!” said the Reel Dance Monks. “We need a Down Beat and an Up Beat for our faster music.” What to do? The Monks formed committees, had meetings and agreed on a compromise. Cut Common Time in half to create a feel of 2 beats per bar. Nothing changes but the feel. There are still eight 8th notes in Common Time and Cut Time. One whole note still fits one bar. Count out loud the following to a steady beat: 1 2 3 4 / 1 & 2 & / The only thing that changes is the way you say it. Notice, Cut Time is not Double Time. Double Time is another blog. In 1957, Dwight Tomb, Percussion Instructor for the McMurray College summer band camp in Abilene, Texas, had us write a 32 measure 2/4 rudimental drum solo. While studying 2/4 solos, I discovered by copying measures written in 2/4, I could connect the bars together like beads! Eureka! Each measure would be correct. However, When Mr. Tomb played it, I realized it didn’t make musical sense, but the note divisions were correct. Get a box of dominoes and experiment. Cut out the numbered measures on the attachments and tape them on dominoes to simulate bars of movable print. Mix the Common Time and Cut Time notes down as you would to play dominoes. Draw eight dominoes and put them in any order to get a sense of how typesetting worked. Set a metronome at 100 beats per minute. Count and play out loud the bars you drew. Move them around to try to make musical sense. I’ve used rhythm on dominoes for years as an effective teaching aid. Here are visuals for Common Time and Cut Time. Look at your hand. Spread your fingers. What do you see? I see five lines and four spaces. During the late 1400’s and early 1500’s music notation was becoming what we would recognize today with a five-line staff. Look up early music notation on the internet for examples. The Math Monks (from The Order of The Notes) had cut the pizza pie and figured out the binary divisions of the whole pie or whole beat which was a big discovery. However, they were Math Monks and needed the help of Calligraphy Monks to draw notes to represent the pie numbers. The Calligraphy Monks were familiar with the written music of the day that used note heads of different shapes with a stem attached to indicate: long, short, long‐short and short‐long durations of pitches. The five-line staff had been established for pitches; but, a standard system was still needed to represent the duration of a pitch. At this time, there were no bar lines, measures, meter signatures or rests. The Calligraphy Monks came up with a brilliant system for notating the duration of pitches. They started with a circle to represent a whole pie, or beat. They attached a stem to the circle to represent a half. What next?? Color in the note head and leave the stem to represent a quarter. While they were pondering what to do with an eighth note, the Gardner Monk brought fresh vegetables for a pizza and suggested they add a flag to the top of the stem to represent an eighth. Brilliant, said the Monks. So, the first flag represented an eighth note and they just added flags for 16th, 32nd, and 64th notes. They could have added flags for 128th, 256th, 512th, etc., but 64 was enough. I’ve only seen 128th notes in Symphonic music and it looked like a centipede. This chart is an example of modern notes and rests. I can imagine our musical ancestors during the late Renaissance meeting in an Abby, trying to figure out how to write music as we know it today. Think about a group of 64 musicians, singers, dancers and song writers who were tired of arguing about how to write the divisions of the beat. It had been a long intense day… So they left the meeting room except for two very hungry math Monks who were members of The Order of the Notes. The two Monks ordered a pizza pie and continued to discuss written rhythm. When the pizza was delivered, the aroma filled the room and the Monks cut it in half. Before they could take their piece of pie, two more of the group came in and wanted some pie too. So, they cut it into four pieces, then eight, 16, 32, and finally 64. I hope it was a big pie. They came up with the most famous example of dividing the beat…The Pie Chart. Euclid and Pingala would be proud of them. So, our modern notation for writing rhythm is a geometric division base two binary math sequence. (Whew… I can’t believe I wrote that) Since rhythm is a division of a whole beat, it can be written and played as numbers. Notes and staffs are not needed to write rhythm. When I was touring with Country Music bands, I thought about writing some rhythm on truck stop restroom walls amidst all the trucker graffiti. I should have. The Order of the Notes will help you understand what I mean about the binary division of the beat and writing rhythm as numbers. On March 5, 1984 around 6 a.m., my heart attacked me. As a result, I had a triple-bypass operation and lost the use of my right leg because of complications from Streptokinase, a clot busting drug. Since I didn’t have a leg to stand on, which was also the leg I used to play the bass drum, I had to drop out of the Country Music Scene. I was fortunate enough to be hired by Ed Null, the owner of L. C. Tiller, Inc. in Nashville, Tennessee as a full-time employee. Clarence Whaley, who also worked for L. C. Tiller, Inc. was totally blind because of Glaucoma. He was a very fine musician, piano tuner and salesman. He was also very smart. It was around this time that Mr. Null bought a Tandy Color Computer II for the store which Clarence and I started learning how to program using BASIC, a friendly programming language. I had song-writing friends who wrote commercial jingles that sometimes needed to last for exactly so many minutes and seconds. So, Clarence and I wrote a program to figure the correct tempo to make a Jingle last exactly a certain amount of time. Here is the original BASIC Songtime program. The BASIC version couldn’t be named Songtimer, which would have been a better name, because program names in BASIC could only be eight ASCII characters long. Doctors listen to your heart beat and feel your pulse to count how many times your heart is contracting in one minute. As musicians, we listen, feel, find, count, ignore, keep, flip, skip, rush, drag, conduct, pound…Pound…w a i t…STOP!!! WARNING!!! Pounding the beat killed Jean‐Baptiste Lully. Consider the beat as an instant reference point with no dimensions, just a point in time. It takes two beats to set the tempo and start measured motion. Never start playing before you set the tempo. For example, to the beat of a metronome set at 100 beats per minute, say “One Two Ready Play”, grunt, tap, motion, signal or whatever you can think of to get started. Just don’t start without preparing to play. Beats can be seen, heard, felt, and maybe even smelled. Being able to recognize and play on the beat is a developed skill. Some of you will naturally play on the beat; but, most of us will have to work at recognizing and playing on the beat. Become obsessed with playing on the beat. 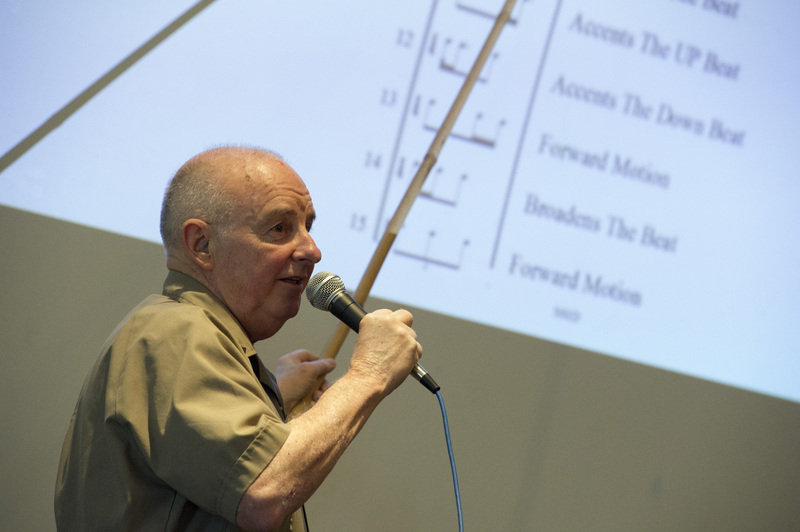 Joseph Schillinger stated that music is a form of movement. Both movement and music are understandable with our existing knowledge of science. He expressed the belief that certain patterns were universal, and common to both music and the very structure of our nervous system. In 1815, Johann Maelzel patented the first mechanical device called a metronome, to keep a steady beat and aggravate musicians. In 1966, I realized the value of playing with a mechanical beat from a solo organist that played a Wurlitzer Organ with a rhythm machine called The Sideman. On occasion when I played drums in his combo, I noticed his timing was right on and rock steady because of the time he spent playing with The Sideman. Think of beats as targets moving in a line. Concentrate to hit the center of each target. Use a metronome or rhythm machine with ear phones so you can’t ignore the beat. Count beats as you walk. Odd numbers 3, 5, and 7 naturally alternate. Look and listen for beats like windshield wipers, a dog’s tail wagging, etc. Move to the beat with a variety of music. March, dance, exercise, etc. Learn to conduct the basic patterns 2/4, 3/4, and 4/4. The attachment is a visual chart of beats. Who am I and why am I writing a blog? I’m Roy Barbee, a 69 year old drummer and teacher, who has acquired wisdom and knowledge from experience, excellent teachers and fellow musicians. I’m still learning and seeking better ways to play and teach. Over the years, my students have urged me to write a book. Now I’m being urged to write a Blog. So, I’ll give it a try. However, in the blogosphere I think I’ll just be another tree frog croaking away in the dark of night just trying to be noticed. I feel an obligation instilled in me by Robert L. Maddox, my high school band director, to share practical drum knowledge and musicianship. In 1957 we didn’t have a drum teacher in Odessa,Texas; so, Mr. Maddox solved the problem by requiring us learn to play the 26 NARD (National Association of Rudimental Drummers) Rudiments and three solos found in Haskell Harr Book II. We learned how the rudiments and solos should sound from a recording made by Frank Arsenault for the Ludwig Drum Company. We taught each other how to play by sharing our discoveries and that’s why I’m writing a Blog. As an example of what I’ll be publishing, I’ve attached a Quantize Chart that I wrote in 1985 when I began programming Yamaha RX11 Drum Machines for song writers in Nashville, Tennessee. The Quantize Chart that came with the RX‐11 was just numbers which made step writing and spot corrections difficult because there was no connection with notes; so, I wrote one using notes and numbers. When Finale, a computer music writing program became available, I was able to include divisions of five and seven. I hope you find these Quantize Charts useful as a teaching aid and programming tool. 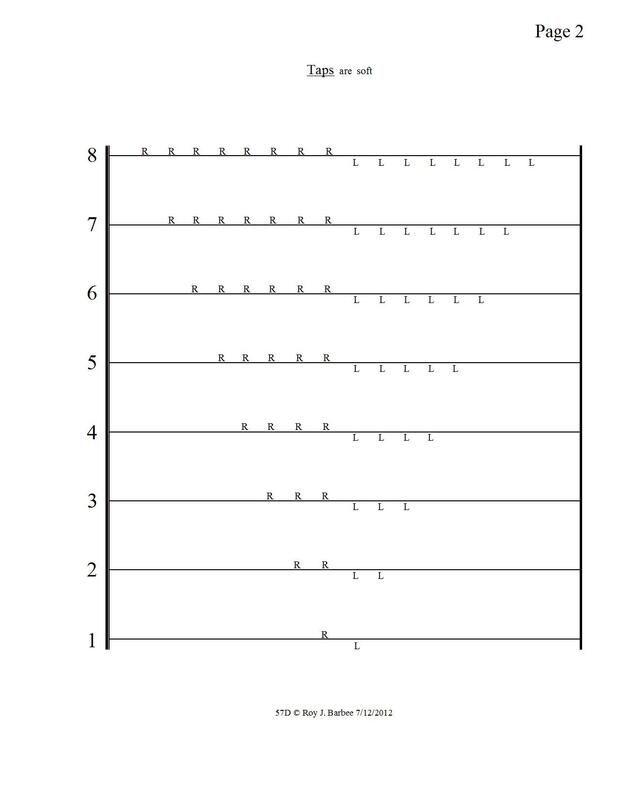 Note: Print the attached Quantize Charts using the Landscape setting. P.S. Anything you don’t understand in this Blog can be found on The Internet. Before the computer age, “Stop the presses!” was an order seldom commanded during the printing of a newspaper because it caused chaos and cost a lot of money. The pressure on the editors, reporters, writers, Linotype operators, press operators, and delivery people to produce the breaking news story was tremendous. So, the reason for stopping the presses had better be an event that is most important. When news papers make a mistake, they don’t stop the presses; they print a correction in the next issue. The last time I published a blog, I wanted to scream “Stop the presses!” but it was too late. 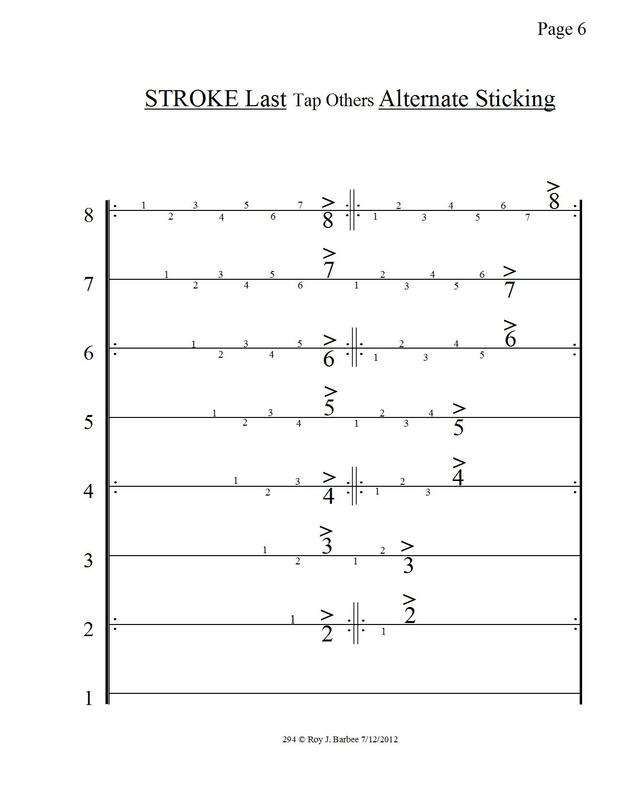 As I looked over my blog on the continuous 11 stroke roll, I noticed I had called it a Continuous 13 Stroke Roll. I’m posting this blog to correct the mistake. Here’s a toast to the digital age of writing and printing. The Tap13 Stroke Roll is one of the most played rolls in Scottish side drumming and is a variation of the Root 13. The Tap13 Stroke roll has 7 primary strokes which I think of as 7 wrist movements. Tap the 1st and last primary strokes. Practice your wrist movements without sticks. Just air drum the primary strokes and think the Taps. You will need a teacher to help you learn to play the Tap 13. The following chart and practice patterns are to help you understand the elements of the Tap 13. The following attachments are PDF files. 52.1 is a chart of the Tap 13 stroke roll. 52.2 is an on the beat Tap 13 4/4 practice pattern. 52.3 is an off the beat Tap 13 3/4 practice pattern. 52.4 is an on and off the beat Tap 13 4/4 practice pattern. 52.5 is an on the beat Tap 13 6/8 practice pattern. The Snap 13 Stroke Roll is one of the most played rolls in Scottish side drumming and is a variation of the Root 13. The Snap13 Stroke roll has 7 primary strokes which I think of as 7 wrist movements. Bounce the first 5 wrist movements and tap the 6th and 7th wrist movements. Practice your wrist movements without sticks. Just air drum the primary strokes. You will need a teacher to help you learn to play the Snap 13. The following chart and practice patterns are to help you understand the elements of the Tap 13. 51.7 is a chart of the Tap 13 stroke roll. 51.537 is an on the beat Tap 13 stroke roll 4/4 practice pattern. 51.537A is an on the beat Tap 13 stroke roll 3/4 practice pattern. As you have noticed, I haven’t posted a blog since before Christmas. I was going to write a series on rolls but I got sidetracked writing about bodhran beatings for the Atlanta Piping Foundation Workshop in February. The PDF files were included in the slide show (please see below). Feel free to download them and use them. I’ll start the blogs next week. Enter your e-mail address to follow "Stick Drummer Wisdom" and receive notifications of new posts by e-mail.